Yesterday, the sixth-place ranked San Diego Chargers knocked off the Cincinnati Bengals, who happened to be undefeated at home all season long. In fact, the Chargers didn’t just beat the Bengals, they wiped the floor with them, beating the turnover-prone team by an impressive 27-10 score line. As I watched the game, I couldn’t help but wonder what it’d be like if the team’s signature lighting bolt logo was replaced by a credit card instead. Can you imagine an American Express card on the side of the helmet? It’d be a fitting, yet shameless plug for whichever credit card company bought the ad space. Back in 1959, the Chargers were formed along with seven other teams in the nascent American Football League. 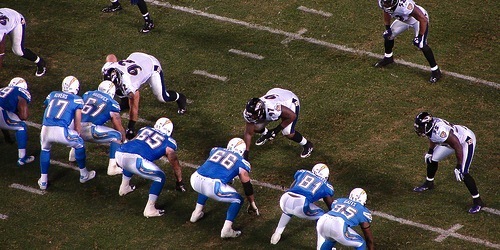 During the first year of play, the team played in the L.A. Coliseum and was known as the Los Angeles Chargers, before moving to San Diego a year later. The original owner of the team was hotel heir Barron Hilton, son of Conrad, who founded the Hilton Hotel group. This is where the rumors start. Because Barron Hilton was the founder of the charge card company Carte Blanche, many assumed the San Diego Chargers got their name from a credit card reference. But Hilton debunked the rumor in an interview with the LA Times, in which he noted that a contest was held to pick the name. He said the name came from the ubiquitous trumpet call, followed by a collective “Charge!” often uttered by fans at sporting events. From this came the name “Chargers” and the rest is history. Oh, and that lightning bolt on the helmets originated from Hilton’s passion for flying. He explained that the Air Force logo had a similar design, a royal blue lighting bolt, which he wanted to emulate. So that’s that – the rumors aren’t true. The San Diego Chargers were NOT named after a credit card, as cool as that might be. But if advertising ever makes it to NFL uniforms, expect a credit card company to get all over the Chargers, literally. It is issued by Barclaycard and comes with a 10,000-point bonus after you spend $500, which is good for a $100 statement credit. The card also offers 20% off at NFLShop.com, along with 2 points per $1 spent on NFL or team purchases in the stadium, all with no annual fee. Put simply, it’s not a very feature-rich credit card, and more well-suited for the exuberant NFL fan, as opposed to the consumer looking to get the most out of their credit card. Read more: Which credit card offers the best rewards? Wow, I had no idea. Always assumed it had to do with lightning bolts. Never knew there was a credit card connection. Previous Previous post: Who Is C F Frost of American Express Credit Card Fame?